The quality of education is influenced by many factors in it. These factors include students, school managers, educational environment, quality of education, curriculum, learning materials and so on. A good learning system will produce good quality education, then a good assessment system will encourage teachers to determine good teaching strategies and motivate students to learn better. In connection with that, the learning needs of teachers who are not only able to teach well, but also able to evaluate well. Evaluation is not only based on the assessment of learning outcomes, but also an assessment of input, output and the quality of the learning itself. Research instruments can be interpreted as a tool for collecting research data. Basically the research instrument consisted of tests and non-tests. Non-test instruments are testing instruments in addition to learning achievement tests. Assessment tools that can be used include observation or observation sheets (such as diaries, portfolios, life skills), attitude test instruments, interests, interview techniques, questionnaires, sociometry, case studies, and so on. In the development of non-test instruments that need to be considered are the steps to develop the instrument, the preparation of the non-test instrument grid, and the rules for writing instrument items. In this study will be explained in detail about the preparation of non-test instruments, scoring techniques and also the rules of writing a portfolio. Mardapi, Djemari. (2003). Pengembangan Sistem Penilaian Berbasis Kompetensi. Makalah disampaikan pada Seminar Himpunan Evaluasi Pendidikan Indonesia (HEPI). Yogyakarta. Nur, A., Rohaeti, E. E., & Maya, R. (2018). IMPROVING THE ABILITY OF MATHEMATIC CONNECTION AND SELF-CONFIDENCE’S STUDENT OF JUNIOR HIGH SCHOOL THROUGH PROBLEM-BASED LEARNING. JIML-Journal of Innovative Mathematics Learning, 1(3), 307-311. Ahmad, H. (2018). Efektivitas Penggunaan Alat Peraga Kodama dalam Mengerjakan Soal Matematika. Pepatudzu: Media Pendidikan dan Sosial Kemasyarakatan, 13(2), 118-132. Hari, L. V., Zanthy, L. S., & Hendriana, H. (2018). PENGARUH SELF EFFICACY TERHADAP KEMAMPUAN BERPIKIR KRITIS MATEMATIK SISWA SMP. JPMI (Jurnal Pembelajaran Matematika Inovatif), 1(3), 435-444. Murnaka, N. P., & Dewi, S. R. (2018). Penerapan Metode Pembelajaran Guided Inquiry untuk Meningkatkan Kemampuan Pemahaman Konsep Matematis. Journal of Medives: Journal of Mathematics Education IKIP Veteran Semarang, 2(2), 163-171. Sholihat, N. A. N., Hidayat, W., & Rohaeti, E. E. (2018). PENGHARGAAN DIRI DAN PENALARAN MATEMATIS SISWA MTS. JPMI (Jurnal Pembelajaran Matematika Inovatif), 1(3), 299-304. Pujiono, A., & Basuki, I. (2018). PENGEMBANGAN PERANGKAT PEMBELAJARAN INSTALASI MOTOR LISTRIK MODEL PEMBELAJARAN PROBLEM BASE LEARNING BERBANTUAN SOFTWARE ELECTRICAL CONTROL TECHNIQUES SIMULATOR (EKTS) DI SMKN 1 DRIYOREJO. Jurnal Pendidikan Teknik Elektro, 7(2). Wahidmurni, Alfin Mustikawan, dan Ali Ridho. (2010). Evaluasi Pembelajaran: Kompetensi dan Praktek. Yogyakarta. Rahardja, U., Harahap, E. P., & Dewi, S. R. (2019). The Strategy of Enhancing Article Citation and H-Index on SINTA to Improve Tertiary Reputation. TELKOMNIKA (Telecommunication Computing Electronics and Control), 17(1). Handayani, I., Aini, Q., Cholisoh, N., & Agustina, I. I. (2018). Pemanfaatan Google Form Sebagai Pendaftaran TOEFL (Test Of English as a Foreign Language) Secara Online. Handayani, I., Aini, Q., & Sari, N. (2018). Pemanfaatan Sistem iJC Berbasis OJS Sebagai Media E-Journal Pada STISIP YUPPENTEK. Technomedia Journal, 2(2), 94-106. Yusup, M., Padeli, P., & Ilamsyah, I. (2017). General Journal Recording System Analysis In Companies using Online Accounting Software. 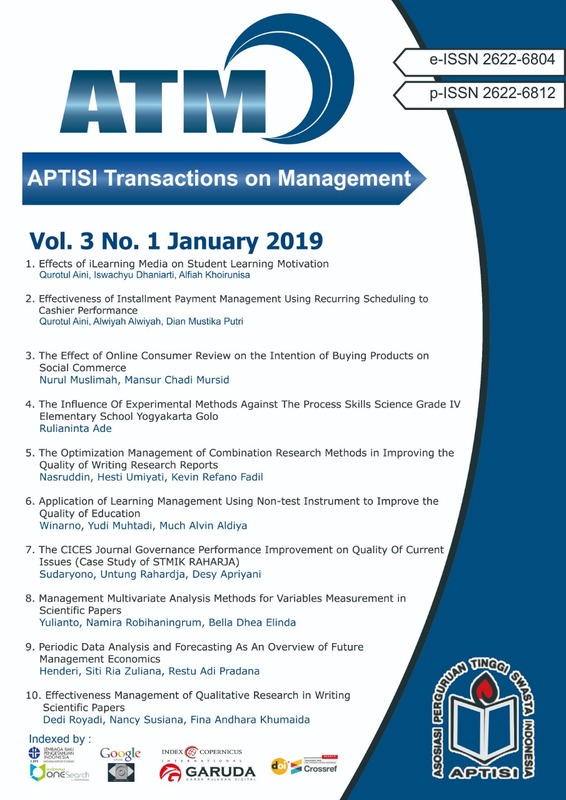 Aptisi Transactions of Management (ATM), 1(1), 54-59. Djatmiko, B., & Husain, A. (2017). Analyze and Record a Series of Corporate Sales Transactions On Web Based Accounting Online System. Aptisi Transactions of Management (ATM), 1(2), 110-122. Raharja, U., Lutfiani, N., & Wardana, W. S. (2018). Penjadwalan Agenda Pelaksanaan Tridharma Perguruan Tinggi Secara Online Menggunakan Google Calendar. Rahardja, U., Lutfiani, N., & Alpansuri, M. S. (2018). Pemanfaatan Google Formulir Sebagai Sistem Pendaftaran Anggota Pada Website Aptisi. or. id. SISFOTENIKA, 8(2), 128-139.